WASHINGTON — SpaceX has started initial tethered tests of the first prototype of its next generation Starship launch vehicle at its South Texas test site. The vehicle, dubbed “Starhopper,” briefly fired its single Raptor engine during a test on the pad April 3, followed by a second test April 5. In both cases the engine fired for only a few seconds, and the vehicle, tethered to the ground, lifted off the ground by only a very short distance. “Starhopper completed tethered hop. All systems green,” Musk tweeted April 3 after the initial test. 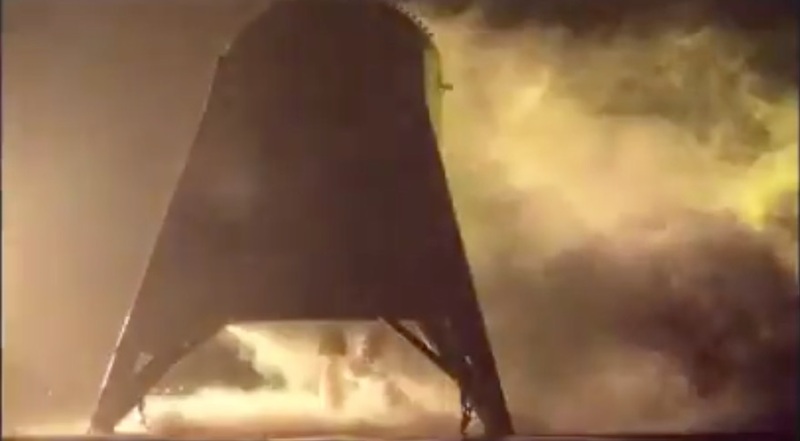 He posted a two-second video after the second test April 6, showing the engine igniting and the vehicle, largely obscured by the plume from the engine, appearing to rise off the pad slight. “Starhopper just lifted off & hit tether limits!” he said after the second test. Starhopper is a prototype of Starship, intended to be the upper stage of SpaceX’s next-generation, fully reusable launch vehicle. The vehicle currently being tested is only the lower section, hosting engines, propellant tanks and landing gear. An upper section, consisting of a nose cone, was damaged during a windstorm at the Texas site earlier this year, and SpaceX decided not to repair it for this vehicle since it’s not needed for the low-altitude test flights planned for it. The vehicle will later perform a series of free flights to test its ability to both take off and land vertically. In a license application to the Federal Communications Commission last November, SpaceX said it planned a series of test flights of the vehicle initially going as high as 500 meters and later as high as 5,000 meters. The up-and-down nature of these tests led to the vehicle being dubbed a “hopper” and, later, Starhopper. The test flights have attracted attention from both locals as well as spaceflight enthusiasts, some of whom have traveled to the site, on the Gulf Coast near Brownsville, Texas, to try and catch a glimpse of the vehicle and its flight tests. Webcams regularly track activity at the site despite, in the case of the latest test late April 5, dense fog that made it difficult to make out anything but the flash from Starhopper’s engine as it briefly fired. Neither Musk nor SpaceX have disclosed specific schedules for upcoming test flights. Prior to the April 5 test, SpaceX filed temporary flight restrictions with the Federal Aviation Administration in the airspace immediately surrounding the test site to an altitude of 300 meters for several hours each day on April 5 through 7. After the April 5 test, SpaceX withdrew the FAA airspace restrictions for April 6 and 7. Musk said last month that work is already underway on the second Starship prototype, capable of reaching orbit. Eventually, SpaceX will pair Starship with a booster stage called Super Heavy to be able to place large payloads into orbit. Those vehicles are also the cornerstone of SpaceX’s plans to establish a human presence on Mars as soon as the 2020s.